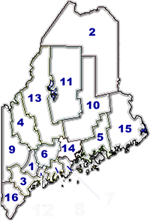 Oxford County, western Maine, U.S. It consists of a mountainous region bordered to the west by New Hampshire and to the north by Quebec, Can. The Appalachian National Scenic Trail crosses the Maine–New Hampshire border along the Mahoosuc Range and traverses the northern part of the county via Old Speck, Baldpate, and Goose Eye mountains. The Androscoggin River bisects the county from west to east. Other waterways include the Swift, Saco, and Crooked rivers. Aziscohos, Kezar, and Upper Richardson lakes are among the largest lakes. Primary forest types are maple, birch, and beech, with stands of pine, spruce, fir, and aspen. Public lands include Grafton Notch State Park and White Mountain National Forest. The county was created in 1805 and named for Oxford, Mass. The county seat is South Paris. Formerly an Abnaki Indian settlement known as Pequawket, Fryeburg was one of the state's first English farming communities. Rumford Falls on the Androscoggin River provided hydropower for Rumford's pulp and paper mills from the late 19th century. The town was the site of a planned community in the early 20th century. Other communities are Mexico, Norway, and Bethel. Sawmills, paper mills, and apple orchards contribute to the economy. Area 2,078 square miles (5,383 square km). Pop. (1990) 52,602; (1996 est.) 53,797.